BANGOR, Maine — When New England Fights brings mixed martial arts back to the Cross Insurance Center Sept. 8, the Maine-based promotion also will be hosting a retirement party of sorts. And Patrick Kelly hopes to be the one celebrating. “I started this journey five years ago in Bangor [training] with Young’s MMA,” said Kelly, who will observe his 54th birthday Saturday. “It is only fitting I have my farewell fight in the same great city. I am very grateful to NEF for the opportunity to fight in their cage and ultimately win a title. Kelly began competing in mixed martial arts after a successful wrestling career that included winning a high school state championship as a senior at the former Camden-Rockport High School in Rockport, and claiming a New England title and trip to the NCAA championships while competing at the University of Maine. He has been the longtime wrestling coach at his alma mater, now Camden Hills Regional High School, where he has helped the Windjammers win 15 state team championships. He mentored the likes of Ultimate Fighting Championship middleweight fighter Tim Boetsch. Kelly was inducted into the Maine Amateur Wrestling Alliance Hall of Fame in 2007. “There are a lot of folks that have helped to shape the story of Maine wrestling, but coach Kelly is in a class all of his own when it comes to the impact he has had on the sport in our state,” said New England Fights co-owner and matchmaker Matt Peterson of Rumford. 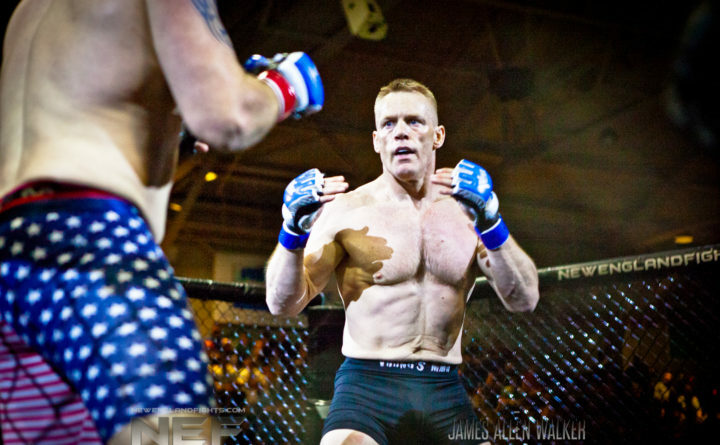 Kelly made his mixed martial arts debut in September 2014 with a first-round submission of Frank Dellasala at the Androscoggin Bank Colisee in Lewiston. He followed that with technical-knockout victories over Steve Bang Jr. in November 2015 and Bang’s father, Steve Bang Sr., in June 2015. After a two-year hiatus, Kelly returned to the cage to win the NEF amateur lightweight championship with a three-round unanimous-decision victory over previously undefeated Rafael Velado — a fighter 14 years his junior — in June 2017. Kelly will spot a full three decades to his final opponent in the cage, with the 24-year-old Manning coming off two first-round submission victories since making his amateur debut late last year. The Tallahassee, Florida, product required only 37 seconds to stop Andrew Harris with an armbar in his first fight at Jekyll Island, Georgia, last November. His most recent win came by arm triangle over Michael Vizza 1:37 into the opening round on Feb., 10 in Jacksonville, Florida.